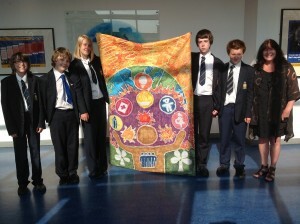 A Leeds School has won a national competition with their art work raising awareness of the United Nations Millennium Development Goals. 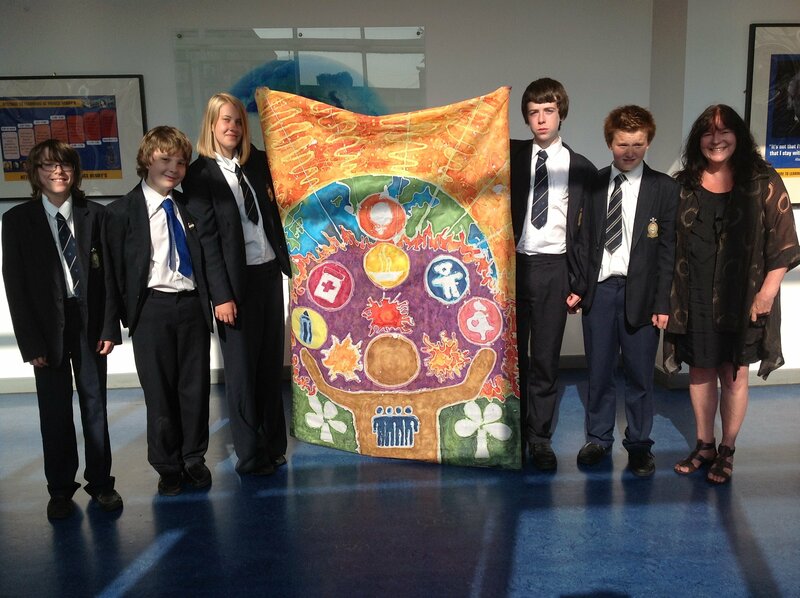 Students from Prince Henry’s Grammar School came top with a colourful batik design. “We wanted to show how the Millennium Development Goals are a careful and delicate balancing act, with rays of hope radiating from behind as we move closer to achieving them,” said year 9 student Max Behrens. The United Nations Millennium Development Goals include targets to reduce the number of people living on less than one dollar a day and ensure that every child is able to complete primary school. See all the entries to the MDG15 competition here. Fairtrade Yorkshire film winners woop for joy with Greg Mulholland MP, Hannah Langdana from Leeds DEC and teacher Jen Lansdown. 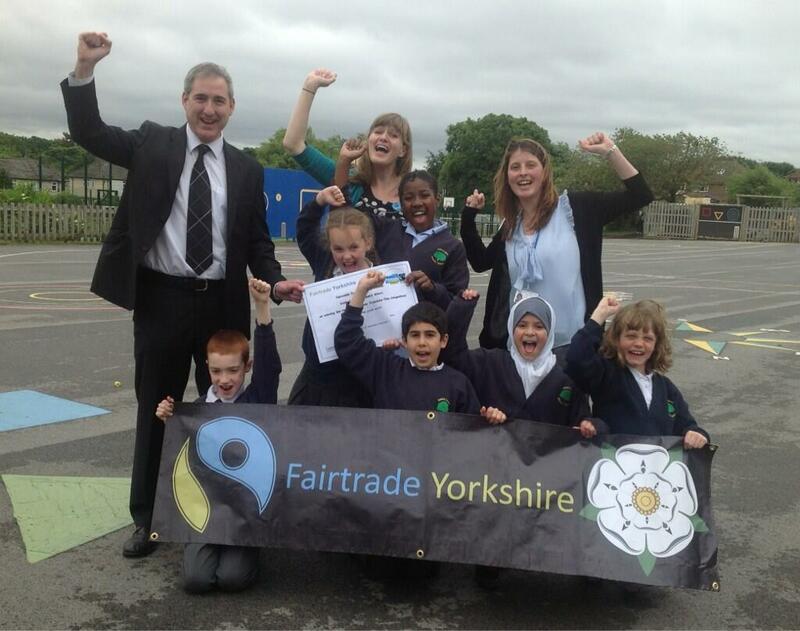 This year’s Fairtrade Yorkshire Film competition was won by children from Ireland Wood Primary school in Leeds, with their film entitled “Fabulous Fairtrade Yorkshire”! The school was presented with a certificate and cheque for £200 by Leeds MP Greg Mulholland and Fairtrade Yorkshire chair Hannah Langdana, at an award ceremony at the school on Friday June 28th. The competition set schools across Yorkshire the task of making a film to celebrate Yorkshire’s status as the UK’s first Fairtrade Region. Each year Fairtrade Rotherham give a prize to the Rotherham College student who has made the most outstanding contribution to the promotion of Fairtrade. This year’s winner, Ashley Dalton, is seen here with his certificate, presented by Councillor Ken Wyatt of Rotherham District Council. 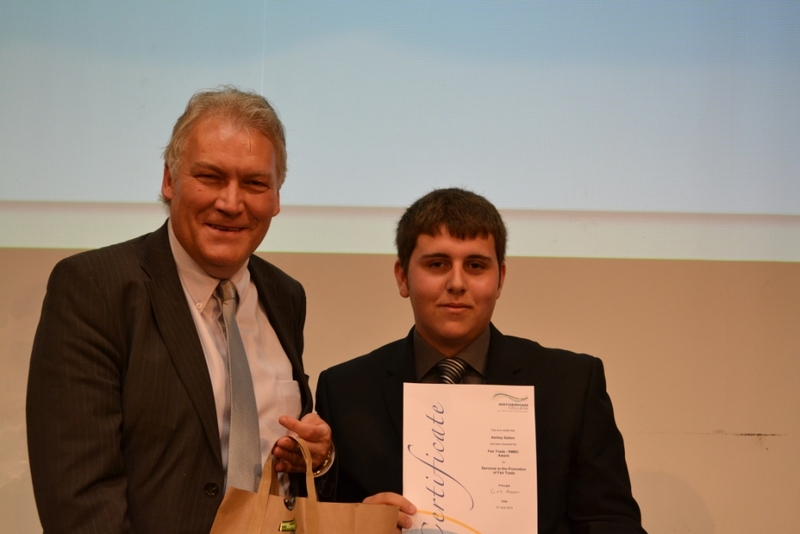 The presentation took place at an awards ceremony where Ashley received a Fairtrade gift bag. During Fairtrade Fortnight fundraising is held at Rotherham College for good causes nominated by Fairtrade Rotherham. 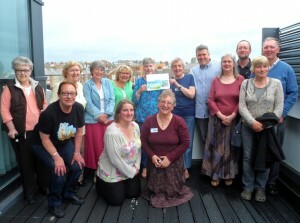 Supporters gather on the roof garden at ‘The Street’ for the Fairtrade Scarborough AGM. Fairtrade supporters in Scarborough Borough met at the new state of the art centre ‘The Street’ for their Annual General Meeting. The event took place on 27th June. Diane showed a slide show of many of the events that had been held to promote Fairtrade in different parts of the borough. This highlighted what a successful year it has been for Fairtrade Scarborough. Mark Dawson, Coordinator of Fairtrade Yorkshire, addressed the seasiders and thanked them for their contribution to making Yorkshire the UK’s first Fairtrade Region. A full set of officers were chosen at the AGM, with all of last year’s officers being re elected. Clearly a winning team. 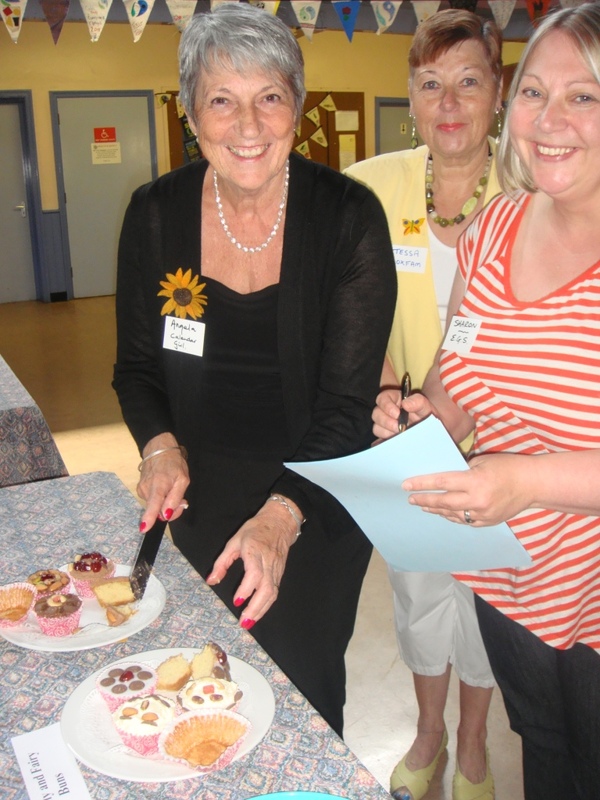 One of the calendar girls (on left) judges the bake off. A big fair bake off was held in Skipton. 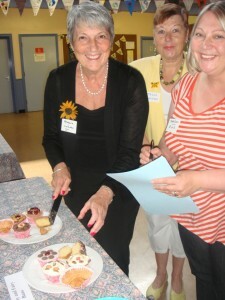 Rather than Mary Berry, Fairtrade Skipton picked one of the famous calendar girls to be the judge. The girls shot to fame as a result of their WI calendar where they bared (not quite) all for charity. Their story was made into a popular movie and they achieved world wide fame. 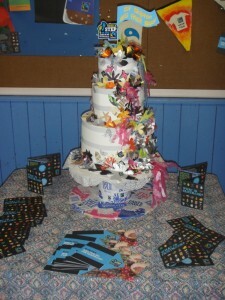 A second year fine art student from Craven College made a fabulous cake from Fairtrade wrappers. 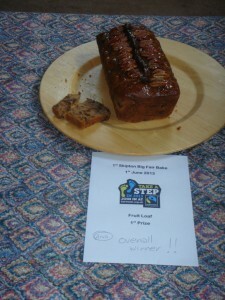 However the worthy winner was a Fairtrade fruit loaf. A classic traditional recipe, superbly executed and winning the taste test. 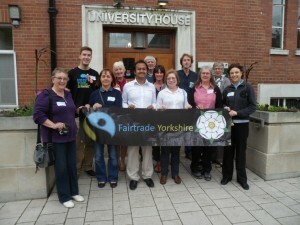 Fairtrade campaigners from across Yorkshire gathered this past weekend at Leeds University for the Fairtrade Yorkshire Campaigners’ Forum. The one-day event was an opportunity for networking, training and learning from each other, and also elected our first regional representative to the Fairtrade Foundation’s National Campaigner Committee. 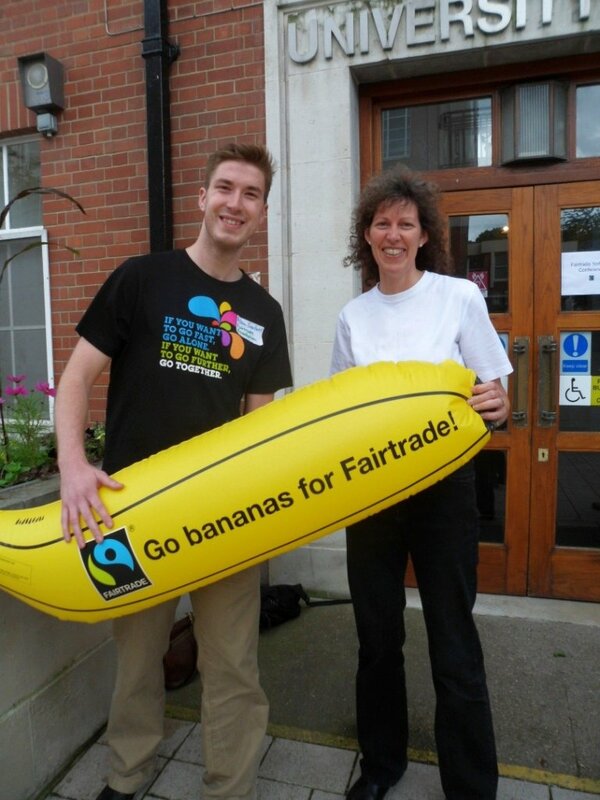 The event was attended by Adam Gardner, Community Campaigns Officer from the Fairtrade Foundation. Discussion sessions looked into the future of Fairtrade campaigning and how Fairtrade Yorkshire can develop. Workshops covered subjects such as activities for schools and raising your local media profile. Children from Bankside Primary School gave a presentation on how their School Council had researched and promoted the use of Fairtrade products, and had learnt about the collapse of the Rana Plaza building in Bangladesh and what it tells us about the true cost of unfair trade. Karen Palframan was nominated and elected as the first Yorkshire representative on the National Campaigner Committee. Karen is the chair of the Bradford Fairtrade Zone and Fairtrade Ilkley groups. 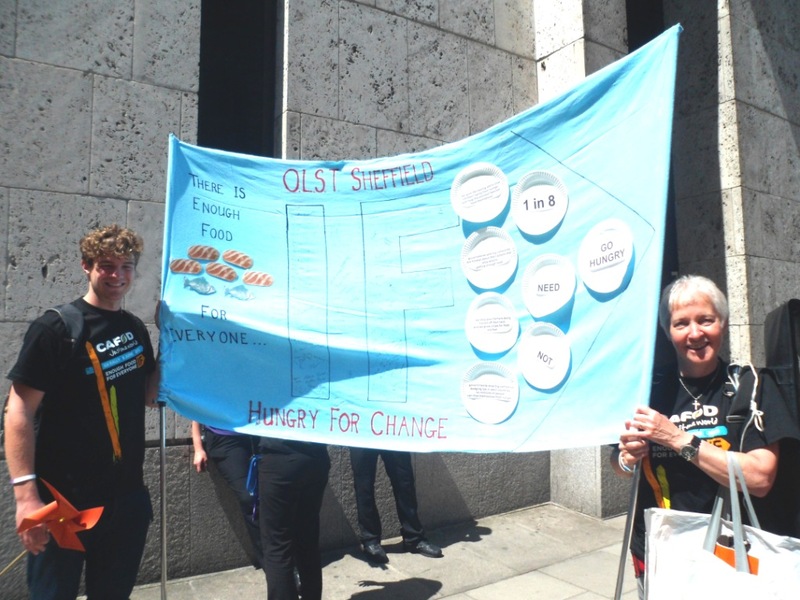 She is an experienced and dedicated campaigner – in May she travelled down to London to keep up the Yorkshire end at the handover of the Make Trade Fair petition to David Cameron. Congratulations Karen! 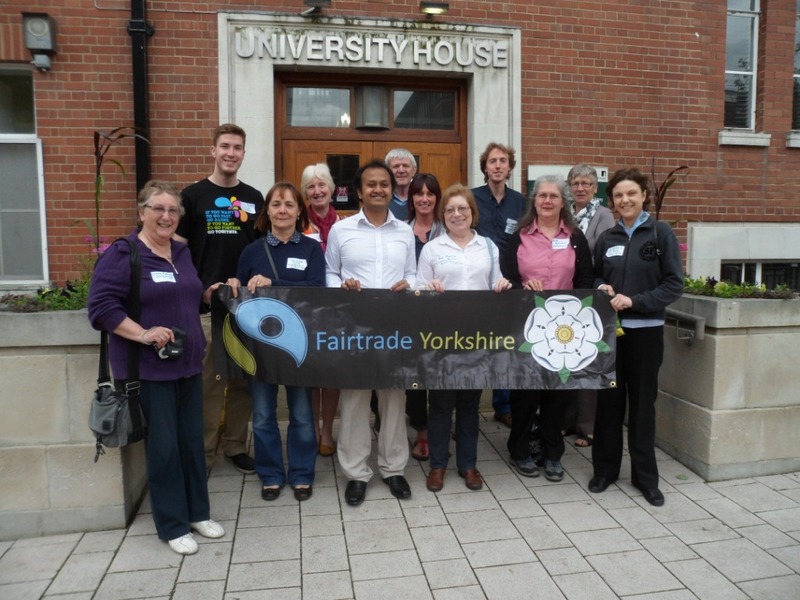 At the Fairtrade Campaigners Forum at the University of Leeds, Mo Zafir of Fairtrade wholesalers, Premcrest announced that they would be supplying the world’s first Fairtrade crisps. 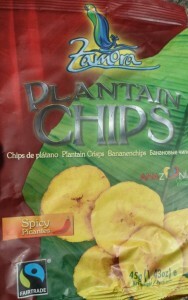 Everyone wins with Zamora crisps. The purchaser gets a delicious product and the plantain farmers get a fair price for their produce, offering them a sustainable livelihood with which to support their families. Fairtrade actvism doesn’t just take place in our cities and towns. The message reaches out to the countryside, even to the most tucked away of places. 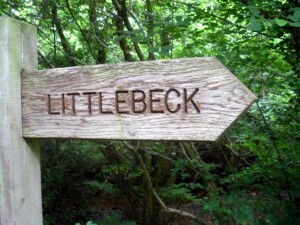 The village of Littlebeck nestles in a hidden valley below the North York Moors, just south of Sleights. The Methodist church in the heart of the village is proud to support Scarborough Borough’s Fairtrade status. The church offers serve yourself refreshments (free, donations welcome) to walkers on the Coast to Coast trek which passes through the village. Of course the tea, coffee and sugar are all Fairtrade. Even in the remotest parts of Yorkshire; you’re never far from Fairtrade. Supporters of the Enough Food for Everyone: IF campaign headed to London for a last push before the G8 meeting hosted by David Cameron. 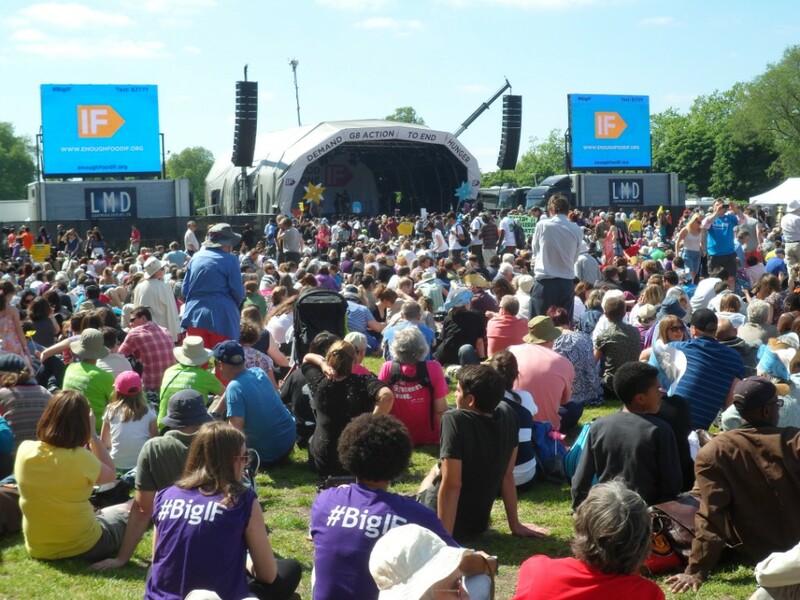 They rallied in Hyde Park on 8th June. 45,000 people came from across the UK to demand the changes necessary so that no one in the world goes hungry. The Fairtrade Foundation had their own display at the event & Yorkshire was well represented with many coachloads of supporters making the journey south. The IF campaigners were joined by Rowan Williams, Bill Gates and Myleene Klass. One of the highlights of the day was the planting of the field of flowers. The two million petals of the paper flowers represent the 2 million children’s lives lost each year to hunger. Lives that should never have been lost and we have a duty to ensure that policies change, so that children do not have to die of hunger and starvation in the future. Read here of Oxfam’s verdict on the G8 meeting and what has been achieved so far by the IF campaign. A large contingent of Yorkshire campaigners headed to the Hyde Park IF rally. 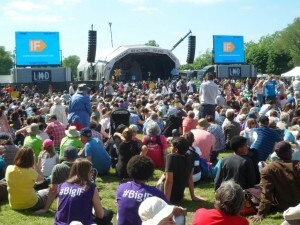 Mark Dawson, Coordinator of Fairtrade Yorkshire, was also amongst the 45,000 strong crowd. He planted one of the hundred of thousands of flowers in the dramatic field of flowers. 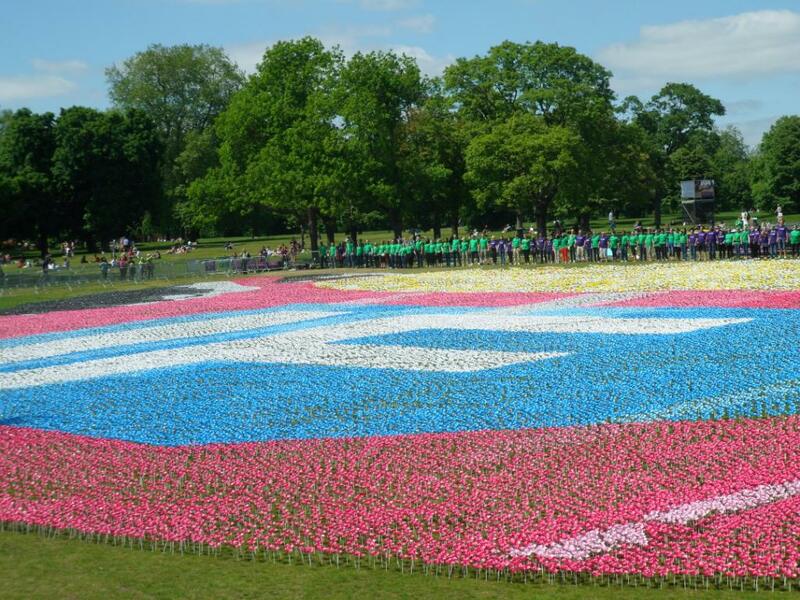 ‘It’s a stunning sight’ Mark commented ‘the symbolic act of planting a flower represents our commitment that we will carry on with the fight until we have a world where no child has to suffer from hunger’. 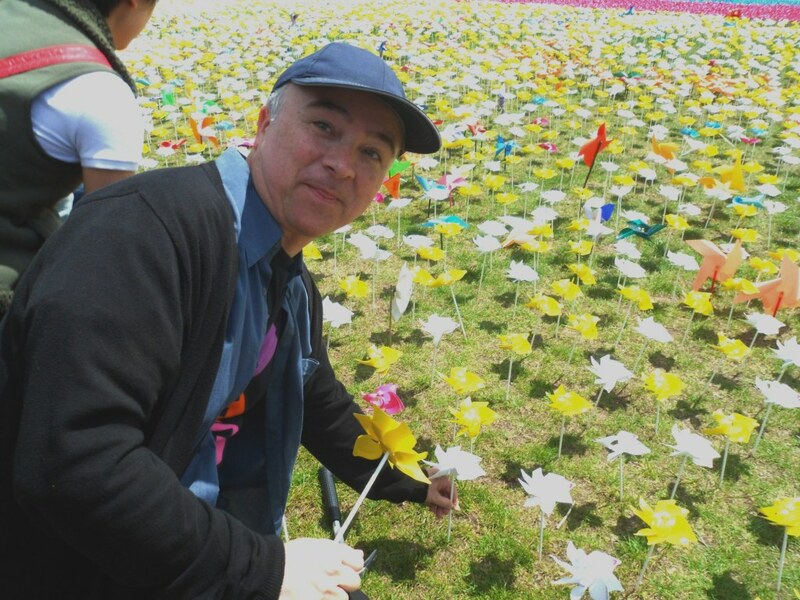 Mark Dawson plants a white rose in the field of flowers.